GEORGETOWN RUNNING CLUB: DOUBLE: 4:18 & 8:44! 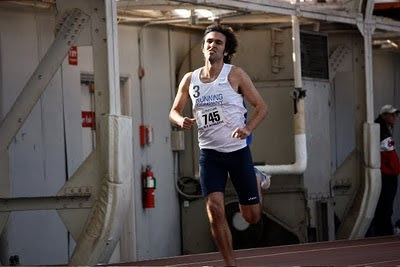 GRCer Murat Kayali ran a solid double at his alma mater, Yale, on Saturday finishing 4th in the mile (4:18) and 5th in the 3k (8:44). Indoor action continues next weekend when GRC sends a squad to the Terrapin Invite in Landover, Md. Murat, Mike Smith, Karl Dusen, Patrick Reaves and Jake Klim are seeded at 8:35 in the 3k. Kitten killer Bert Rodriguez seeded at 8:36. Those are some fast times, especially in the dead of winter. Good show Murat! What time is the 3k vaguely scheduled to start? Nice going, Murat, but that track looks like it's inside of a battleship or something! Impressive for sure. I am excited to see this 3k on saturday. Thanks guys, looking forward to the 3k this weekend. Andy, its more like a greenhouse/warehouse (called Coxe Cage if you want to google image search it), but it does look battleship-esque from that angle.